This is officially designated book 3.1 of the ACOTAR series, meaning that it's not a full novel, but it is a follow-up to the third book. It's kind of a sequel--an epilogue, really--that sets up the spinoff novels that will come out in the future. Summary: Hybern has been defeated, and for now, Prythian is trying to put itself back together and maintain the peace that they fought so hard for. For Feyre, now back with her beloved Rhys and their Night Court, it means settling into her duties as the High Lady. This includes not just the typical responsibilities to their people and their kingdom, but also sorting out the aftermath of everything they just went through (losing her father, nearly losing Rhys), helping her sisters settle into their new lives (not always successfully), and finding her place in this new world. For Rhys, it also includes managing dissension both within his kingdom and between other kingdoms, particularly Tamlin and Spring Court, which sits next to the now wall-less human lands. As the new Court of Dreams prepares to celebrate their first winter solstice together, new troubles pop up, and old troubles continue to linger, but they manage to (mostly) get through it all together. 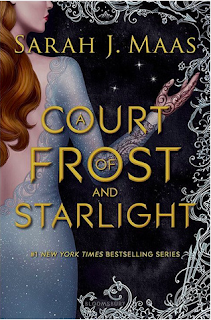 Thoughts: I love this series, so of course I loved this book, but I have to say... 200-something pages (after you're used to SJM's giant tomes) does NOT feel like enough. I mean, I know I have a tendency to slam through her books anyway, but goddamn, it was over way too quickly and I'm feeling a little dissatisfied (just because I've been waiting an entire year, and I needed more than that). That said, ACOFAS gives you plenty to chew on while you wait for the next book (which is going to be full-length!!!). ACOFAS doesn't really have a plot; as I said above, it's more like an extended epilogue, and it also sets up a bunch of things that will be happening in the new spinoff parts of the series, so in that sense, there's a lot going on, but this installment itself is more character-focused. We also meet some compelling new characters in this book, and I hope they make appearances in future books, namely: Emerie, the shopkeeper at one of the Illyrian camps, and Ressina, one of the artists living in Velaris. In sum, I really appreciated that not everything is sunshine and roses after the end of the war, but I also appreciated that not everything is doom and gloom either. (One of the parts that amused me GREATLY was Rhys, Cassian, and Azriel's annual Solstice morning tradition.) It was a nice reprieve from the drama, but it is realistic in the sense that there is still more to be done. Way, WAY more.